Spoiler Alert! This review contains detailed information on the plot and resolution of the novel Deepsix. It is recommended that you read the novel before you read this review. Although it is not absolutely necessary to read The Engines of God,the first novel in the Academy series, before Deepsix, I think it is much more satisfying to read the entire series in sequence. For those who have read neither novel, a detailed introduction to the Academy novels is available HERE. Additionally, my review of The Engines of God is available HERE. 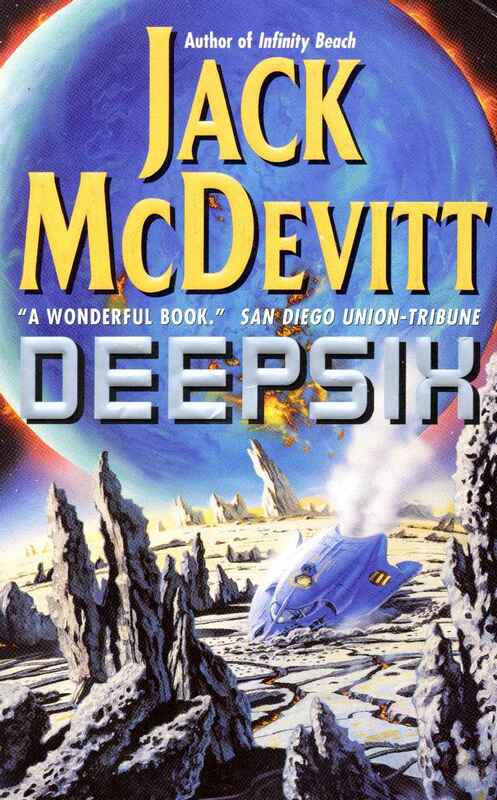 Deepsix is the second of Jack McDevitt’s Academy novels, chronologically following The Engines of God by about 20 years. All of the same conventions of McDevitt’s Academy universe apply equally to Deepsix, with the advancements from The Engines of God added on, namely that Omega clouds have now become an accepted (although still not understood) part of the universe – still under investigation – and that the planet Beta Pacifica III has now become a major archeological site following its discovery by Hutch and Frank Carson. Hutch still works for the Academy as a superluminal pilot, but she is now nearing the age of fifty. Of course, thanks to advancements in medicine, she still looks and feels like a twenty-something “babe”. As the novel opens, she has just made a drop at the archeological site on Pinnacle and is picking up an exobiologist, Randall Nightingale, and some others for a return trip to Earth. Nightingale was the team leader for the first mission to Maleiva III twenty years before and was held responsible for the deaths of several of his colleagues, even though it was not primary his fault. His return to Earth at this time coincides with an expedition to Maleiva III (now renamed Deepsix) to observe its destruction as it collides with a rogue gas giant. In fact the Wendy Jay, captained by Marcel Clairveau, an old friend of Hutch, is currently orbiting Deepsix with a large group of scientists. The onboard scientific community, there to observe the cosmic carnage about to occur, finds previously unnoticed ruins, evidence of an intelligent life form. Since no other ships or archeologists are available to the Academy on such short notice, they send Hutch to investigate. She brings Nightingale and several others to the surface with her and the novel takes off. Each chapter is introduced with a quote from one of the world’s most revered critics (and one of McDevitt’s deepest characters), Gregory MacAllister. He begins as a pompous, self-centered elitist who takes great pride in attacking those as conceited as himself, especially religious leaders and anyone else (besides himself) who makes pronouncements about the state of the world or the nature of existence. But I would strongly advise against taking these little quotes for granted, because there are amazing nuggets of wisdom hidden there – they demonstrate that MacAllister is not all hot air and that he has actually thought some things out. I have taken excerpts from these quotes and sprinkled them around this review to show how McDevitt has worked thematic development into introductory quotations. Consistent with many of McDevitt’s works, the novel begins with a Prologue, which is a flash to the past: October, 2204 (two years after the incidents described in The Engines of God). In this case, it describes Nightingale’s first trip to Deepsix, detailing the deaths of the six mission members who were killed by swarms of red birds with large beaks. It sets up Randall Nightingale as one of the novel’s protagonists and tells the true story of the incident, which would later be distorted to implicate Nightingale as the Academy’s public scapegoat for the mission’s failure. …when his people most needed him, Randall Nightingale fainted dead away. He was rescued by Sabina Coldfield and dragged to safety by that estimable woman at the cost of her own life… Coldfield… was worth a dozen Nightingales. Obviously, MacAllister had no idea what actually happened on Deepsix, nor did he care. As long as he could find someone to make his point, “Mac” did not care what happened to his or her life as a result of his writing. Normally, I do not especially like the use of an opening flashback. It is, of course, a quite valid and well-used technique of novel writing, but it has become a handy crutch that is way over-used. And McDevitt does use it over and over in his novels. That being said, he used it extremely effectively in The Engines of God and does so again here. I think telling the true story of the original incident on Deepsix really does help to set the stage and particularly to set up the later relationship between Nightingale and MacAllister. Beyond the Prologue, the book is broken into three parts. The first part launches the novel into the “present time” of November, 2223. The remainder of the novel occurs over three weeks, ending shortly after December 9, 2223, except for an Epilogue, which wraps up the story at the end. The story covered in Part 1 establishes the scientific team, Hutch’s mission to look for artifacts, the arrival of the luxury liner, Evening Star, the stranding of Hutch’s team on the surface of Deepsix (along with MacAllister) and the evil that Ian Helm does. Yes, McDevitt trots out his villain from The Engines of God. Although Helm was portrayed as an unlikable character in the former novel, at least his motivation was believable and somewhat understandable. Here, he comes across as one-dimensional and flat. In fact, the entire sequence where he purposely disposes of the only lander that could come to Hutch’s rescue feels forced and entirely unneeded. I think it might have been better to simply say that no ship possessing a lander was close enough to arrive in time for the rescue. This act of omission would have saved a few pages in a very long book and would have eliminated one of the only flaws in an otherwise amazing narrative. The first part of the novel brings us quickly to the important things that McDevitt wants us to think about in Deepsix. These themes were partially opened up in The Engines of God, but McDevitt develops them to a very high level in this novel. One of the primary assumptions of the Academy universe is that the people are very, very much like us in some fundamental respects, mainly that there is a ceiling to cultural development and we’ve already reached it. Technology might change some of the situations, such as the sims replacing television, but participation in a three-dimensional sim does not bring any kind of awareness or elevated sense of being. Indeed, the sims only tend to reinforce our basic cultural iconography. Instead of watching a romance or a war drama, you are allowed to <I>participate</I> as your icon replaces a character. It’s still a romance or war drama, essential in every other respect to a television show or movie. McDevitt’s characters are still concerned with the same things we are: ego, relationships, career, dining, and death. Coming together on Deepsix are Hutch, Randall Nightingale, Kellie Collier and Chiang Harmon (two volunteers from the Wendy Jay) and, of course, Gregory MacAllister. He was added to the mix when he brought a young journalist and pilot from the Star to the surface. An earthquake killed the journalist and pilot, as well as one of Hutch’s volunteers, and destroyed both landers, stranding these five on the surface with the cosmic collision less than three weeks away. The fragility of Nightingale’s ego, contrasted against the overpowering ego of MacAllister, is established in this first part of the book as they are brought face to face. Mac was clearly a part of the failure of Nightingale’s career and Randy very much resents that. Mac, on the other hand, feels fully justified in his action and this matter festers as time passes. The inability of Hutch to establish a stable relationship that was developed in the first novel is not really pursued here. Instead, Kellie comes to represent relationship frustration. An attractive young black woman, she is pursued by a number of the men on board <I>Wendy</I>, in particular by Chiang, yet she seems ambivalent about getting involved with someone. Marriage in the early 23rd century is a contractual affair, which requires re-certification periodically. Most people do not renew. People live a lot longer and look younger throughout most of their lives, but ennui begins to set in early and people tend to live more boring lives over all. People are also generally good-looking and most work out religiously to keep their bodies in shape. This also squares with where we are at today. Although we don’t live as long as McDevitt’s characters, the visible society tends to be more and more attractive, young-looking and physically fit. And most of our lives are still boring – or perhaps uneventful would be a better description. There is very little brilliance here and it is generally restricted to a small gene pool. The ugly or overweight people are – by and large – not seen on TV and we tend to elevate beauty. And, for the most part, we are a very boring species. I’ve read the criticism of McDevitt that his characters are rather flat and boring, but in the Academy universe that is just the way people are. In fact, honestly, I am hard put to find ten extremely well-rounded characters in all of science fiction, so I generally find this complaint spurious, but in this case I believe it is completely unfounded. Especially considering the introduction of Gregory MacAllister, who begins as an inflated version of the flat people surrounding him, but is forced to develop a conscience by the events that are about to occur. Self-importance is closely tied to career development. McDevitt’s people spend an amazing amount of time thinking about their jobs, their prospects and their ambitions. Nightingale has essentially given up twenty years of his life because of the loss of his professional reputation. He was working in obscurity on Pinnacle because he couldn’t really get a good job on Earth. He plans on retiring to an isolated part of Scotland where he will never have to see anyone again. And then there is Nicholson, the captain of the Evening Star. He is devastated at the death of a passenger and a crewmember, but not because he regrets the loss of life. He is worried because it is his fault and it could mean the end of his career. John Drummond, a brilliant mathematician, hasn’t produced a major breakthrough since his early twenties and he meditates on how everyone views him and his failure. In our time, it can be argued that we have entered the age where a person’s career is of paramount importance, where a great deal of ego growth and sense of well-being depends on money and power earned through job performance. I would think that much is self-evident. Mac, of course, glows in the public adulation of his writing. It feeds him and keeps him alive. Which brings us to food, which is a constant topic in the worlds of McDevitt. In one sense, it’s not surprising. People who must spend a great deal of time on starships must think about food quite a bit. It’s a way to fight boredom. But it’s more than that; most every event, whether starship bound or Earth bound, is celebrated with food and drink. When Nicholson prepares himself to face a rebellious bunch of wealthy passengers, the first thing he does is order snacks and beverages to be delivered as he arrives on the scene. Food is a part of the overall comfort of society – both our society and in the universe of the Academy. But in Deepsix, for the people who are stranded, food is literally part of the landscape. They are short on rations and must figure out which of the local population is edible and non-toxic. The last item that McDevitt sets up in thematic development is the importance of death. Hutch has a much more intimate knowledge of death than anyone else in Deepsix. Those of us who have read The Engines of God are familiar with the death of Hutch’s close friend, the archeologist, Richard Wald. In addition, she was part of the group separated from their lander on Beta Pac III, when George and Maggie were killed. Finally, she faced death straight-on twice herself, both in the damaged starship as oxygen ran out and as part of the group relentlessly stalked by the Omega Cloud. Some critics argue that McDevitt kills off too many characters. Just as soon as you get to like a character, they get killed. But all of the deaths in the Academy series have a point, usually to force some of the other characters to realize something important – such as how sweet it is to be alive or how impulsive behavior can lead to tragedy or even how cold and unfeeling nature is. It proves its point – and does so more dramatically in Deepsix really than any other of the Academy novels. By the end of Part 1, the body count is already at nine, counting the six who were killed in the Prologue to make Nightingale’s career fall apart and three more in this first part, two due to MacAllister’s ego and one to that cold face of nature. All nine died to advance the story and the theme as concisely as possible, but we’ll only count the three of “present day”. Equally as important as the fear of death, however, is the speed of recovery from grief. There’s a lot of grief in the Academy series, but none of it lasts very long. Part of it, of course, is the same thing that makes us recover from our grief quickly. We are concerned with life and when death interrupts living, we are anxious to get the grieving over with and get back to celebrating being alive. Part of the speedy recovery of grief is that the characters are rooted so squarely in their egos – as are we. Even if a death is our fault, we need to put it behind us quickly so that we can begin to feel good about ourselves as quickly as possible. For that is much of what life in the 21st or 23rd centuries is made up of: concern for our own well-being, safety and comfort. Of course, in Deepsix, the grieving is short because our stranded characters are facing their own survival. They don’t really have the luxury to wallow in grief. Although Mac doesn’t think much of him, it is Nightingale who remembers that the original mission had left a lander behind during their withdrawal. It is their only hope for survival once Ian Helm has done his evil. They remove capacitors from one of the damaged landers and secure them at the site. In order to reach the remaining lander, however, the party will have to cross 175 kilometers of icy, alien land and hostile native creatures. It is mostly during this trek that the novel centers itself and fleshes out the various themes. When struggling to survive in a hostile environment, people are literally stripped to their essence. Fear can be a powerful motivator, for both cowards and heroes. When they first learn that there is no way off the planet, MacAllister’s fear seems to betray the coward in him, yet throughout the march, when push comes to shove, Mac always steps up and faces danger with aplomb. By contrast, Nightingale thinks of himself as a coward and so must test that assumption at every step. Even though he often reacts heroically to situations, he still thinks of himself as a humiliated man. As the group marches across Deepsix, Captain Nicholson decides that he will blame the entire incident on the pilot who lost his life on the surface and will thus manage to save his career. Captain Clairveau demands that the scientists on the <I>Wendy</I> use their talents to come up with alternative rescue plans. This is the ultimate intelligent-monkey challenge: you are presented with an engineering problem – come up with a workable solution. It is John Drummond, the mathematician whose brilliant career has fizzled, who works out the details of salvaging the remains of a Maleivan skyhook and using it as a scoop to skim the atmosphere and pick up the damaged lander. Like Mac, he behaves heroically without actually realizing he is doing so. While romantic relationships never develop, friendship does. Hutch and Kellie bond on a deep personal level. The two women in this group are the leaders, the pilots. They are both in great physical shape and they can make this difficult trek easily. The scene where they are bathing in ice-cold water and hugging each other is terrific writing. On the other hand, the men are two fairly old guys that are out shape, an academic and a pontificating airbag, who are sworn enemies at the beginning of the ordeal. But the trek slows them down, shows them their physical weaknesses and brings them much closer together philosophically. It is not surprising that the four survivors form a lifelong bond. Mac, in particular, gains a lot of compassion during the ordeal and is forced to relax his pomposity. He sees the direct effect of his words on others. He stretches himself and grows as a character. So does Nightingale. A man who wanted nothing more than to retreat from life is forced to face it square on. They learn to kill the local wildlife, but each experience calls upon one of them to taste the food and wait to see if it will kill them. This part of the novel forces all of them to face their own mortality. The capacitors they had set aside are lost to the floods that begin to build, along with the fury of the world around them being torn apart. They are forced to rely on Clairveau’s backup plan. One problem that I had about the final plan to rescue Hutch and the others was that in spite of the amount of wordage expended on it, I still could not visualize how the three ships manipulated the skyhook. I just couldn’t see it in my imagination. Normally, McDevitt is terrific with his description, so I’m inclined to think that it is my own failure. But I’ve now read the book four times (twice in a row in preparation for writing this review) and I just can’t see it. This is a very long novel and I’ve heard complaints from other reviewers about the length. I tend to agree, but with some reservations. Not only is the Ian Helm part extraneous, but I also feel that too much time is expended on the ultimate rescue plan, the Outsiders, the captains huddling and so on. From the time the two landers are destroyed, the real story is the five people stranded on the planet and their own struggle for survival. I do see the value of people pulling together for a common cause, but the narrative could have been tightened up considerably. While investigating the building, Hutch and Randy find themselves trapped in an elevator that is gliding shakily down the mountain on uncertain rails. Kellie pilots the lander around to attempt a rescue, but Nightingale freezes up. Faced with the prospect of dropping hundreds of meters to the ground, he cannot move forward. Hutch manages to manipulate him into the rescue, but time is wasted and they cannot get Hutch out. Aside from worrying about Hutch, Nightingale feels a deep humiliation that he was the cause of her becoming stranded. He realizes that perhaps Mac was right and that he really is a coward. Stranded on the metal scaffolding in the middle of a lightening storm, Hutch must construct a sling from rope and dangle in the skies to prevent electrocution. She hangs there all night in order to be rescued in the morning. Sometimes it’s amazing how much a human being can put up with to hang onto life. The dénouement is a real tour de force of writing. From the moment when Hutch, Kellie, Randy and Mac realize that the scoop is too snarled for the lander to safely enter, they are faced with the immediate prospect of death. Hutch understands that they will have one chance, but that she must sacrifice herself for the others to jump to safety. As pilot, she must stay at the controls to ensure that the other three make it. By the time she will be ready to jump, the lander will already be falling back into Deepsix. While Mac and Kellie jump to safety, Randy seems to be stalling. Hutch suspects that he has frozen up again, but he is actually digesting the fact that Hutch is giving up her life for them and he is formulating a way to give her a chance. He removes a cable and ties it around her waist on one end and his own on the other. He jumps, then Hutch follows, tethered to him with the cable. But she is well below him and her gravity is pulling her down and dragging at Nightingale hanging from the net. What it comes down to is the will to live, to fight for life with your last breath – and in this case to hang on regardless of desperate pain. For Randy, the flesh is being torn off his hands and his arms are being nearly pulled from their sockets, yet he manages to hold on and to save Hutch’s life. At last, Nightingale becomes a hero and is able to throw off the coward’s mantle. Its pretty amazing writing and it sums up the book rather nicely. After the amazing rescue, the Epilogue is certainly anticlimactic, but it does explain what happens afterward and there is some satisfaction in that. With the death of a shuttle pilot the “present day” body count is a mere five (eleven including the prologue). Not too bad really for a book about facing death. Deepsix is a not really a book about harrowing escapes, the ingenuity of people in a crisis, or the awesomeness of cosmic events, although certainly all of these things happen in the novel. Ultimately, this is a book about the sweetness of life. It is about the preciousness of individual existence in a cold, mathematical universe and about the fight to hold on to life at all costs. Perhaps the best tribute one can give to Jack McDevitt is acknowledgment that he shared this truth with us in a big, captivating, and awesome story. Deepsix is an entertaining, page-turning, and thoughtful exploration of the sweetness of existence.